aephelps has no other items for sale. 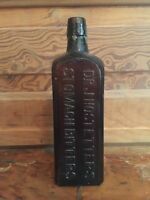 OPEN PONTILED 1800'S DR. JAYNE'S EXPECTORANT - ANTIQUE MEDICINE BOTTLE!! TUMBLED - BEAUTIFUL PEACOCK BLUE VINTAGE AYERS HAIR VIGOR ANTIQUE BOTTLE! SUPER! Antique Sample Miniature "Dr. King's Pills For Constip. "NY Bottle,Labeled & Emb! Pride of the Farm Tomato Catsup Clear 1880s Bottle Newburyport MA Vtg Antique 9"
Mint Cobalt Irregular Hexagon POISON Bottle 2ozs.,4"
Antique Bell-Ans Indigestion Medicine Bottle Orangeburg New York 3"